Five Yixing clay teapots - showing a variety of styles from formal to whimsical. Yixing clay (simplified Chinese: 宜兴泥; traditional Chinese: 宜興泥; pinyin: Yíxīng ní; Wade–Giles: I-Hsing ni) is a type of clay from the region near the city of Yixing in Jiangsu Province, China, used in Chinese pottery since the Song dynasty (960–1279) when Yixing clay was first mined around China's Lake Tai. From the 17th century on, Yixing wares were commonly exported to Europe. The finished stoneware, which is used for teaware and other small items, is usually red or brown in color. Also known as zisha (宜興紫砂) ware, they are typically left unglazed and use clays that are very cohesive and can form coils, slabs and most commonly slip casts. These clays can also be formed by throwing. The best known wares made from Yixing clay are Yixing clay teapots, tea pets, and other teaware. Zi sha or zi ni (紫砂 or 紫泥; literally, "purple sand/clay"): this stoneware has a purple-red-brown color. Zhu sha or zhu ni (朱砂 or 朱泥; literally, "cinnabar sand/clay"): reddish brown stoneware with a very high iron content. The name only refers to the sometimes bright red hue of cinnabar. Due to the increasing demand for Yixing stoneware, zhu ni is now produced in very limited quantities. Zhu ni clay is not to be confused with hong ni (红泥, literally, "red clay"), another red clay. Duan ni (鍛泥; literally, "fortified clay"): stoneware that was formulated using various stones and minerals in addition to zi ni or zhu ni clay. This results in various textures and colours, ranging from beige, blue and green to black. Zisha is a mixture of kaolin, quartz and mica, with a high content of iron oxide. It is mined principally at Huanglongshan and Zhaozhuangshan and has a somewhat sandy texture. The process of preparing the clay is lengthy and was traditionally regarded as a trade secret. Typical firing temperature is between 1100C – 1200C in an oxidizing atmosphere. The raw materials for yixing clay are buried deep underground, sometimes under heavy sedimentary rock formations. When excavated, it is usually located within stratified layers of other clays. The seam of yixing zisha can be as thick as a several decimeters, up to a meter. Yixing clays consist of fine iron-containing silt, with mica, kaolinite and varying quantities of quartz and iron ores as its main mineral constituents. Processing of raw zisha yixing clay involves removing the clay from the underlying strata, drying it under the sun in open stalls, and then pulverizing the dried clay pieces into fine particles. The clay powder then undergoes air screening to isolate clay particles of the finest grit size. The screened clay is then mixed with water in a cement mixer to a thick paste, piled into heaps, and vacuum processed to remove air bubbles, in addition to some moisture from the clay mixture. The quality and quantity of water in yixing clay is critical in that it determines the quality of the stoneware products produced. After this processing, the resulting clay is then ready to be used. The appearance of yixing products, such as its colour or texture, can be enriched and altered through the addition of various metal oxides into the yixing clay, through the manipulation of firing temperatures, and also from regulating the kiln atmosphere (oxidative versus reductive). Yixing teawares are prized because their unglazed surfaces absorb traces of the beverage, creating a more complex flavour. For these reasons, yixing teawares should never be washed using detergents, but rather with water only, and connoisseurs recommend using each tea vessel for one kind of tea (white, green, oolong, black, or puer) or sometimes even one variety of tea only. Early pots were designed for travel use hence you will see the simple classical look of the pots produced during the Ming dynasty. Most tea drinking enthusiast will have one teapot for travel use, these tend to be less expensive and compact in design. It was not until during the mid-Qing dynasty (18th century) that tea connoisseurs started to use the pot at home and the artisan begin to form them into different shape and sizes. Many exotic forms were conceived. Vessels were decorated with poetic inscriptions, calligraphy, paintings and seals were incised onto the surface of the teapots. 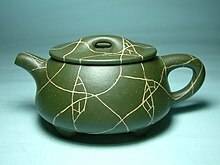 In the late 17th century Yixing teapots were imported to Europe along with China tea. The unfamiliar material inspired attempts to imitate it, and one Delftware manufacturer announced in 1678 that he was making "red teapots", of which no examples are known to survive. Some red stoneware by rival Dutch potters from about 1700 does survive, closely copying Yixing pots in style. Johann Friedrich Böttger, famous as the pioneer of European porcelain, was in contact with some of these and developed a rival Böttger ware, a dark red stoneware first sold in 1710, and manufactured and imitated by others, all up to about 1740. It is a very significant stage in the development of porcelain in Europe. Wikimedia Commons has media related to Zisha. ^ Martin, Laura C. (2007). Tea: The drink that changed the world. Rutland: Tuttle Publishing. p. 103. ISBN 978-0-8048-3724-8. ^ Amies, Alex. Decorative designs in Chinese art. p. 30. ISBN 978-0-9833348-0-4. ^ Lo, Kuei-hsiang (1986). The stonewares of Yixing: From the Ming period to the present day. London: Sotheby's Publications. p. 19. ISBN 978-962-209-112-2. ^ K.S. Lo, et al., The Stonewares of Yixing: from the Ming period to the Present Day, (London, 1986). This page was last edited on 16 February 2019, at 16:52 (UTC).